In the summer of 2013, YouthBuild Philadelphia Charter School was awarded a Youth Leadership Grant from the Starbucks Foundation to support our Leadership Development programming. 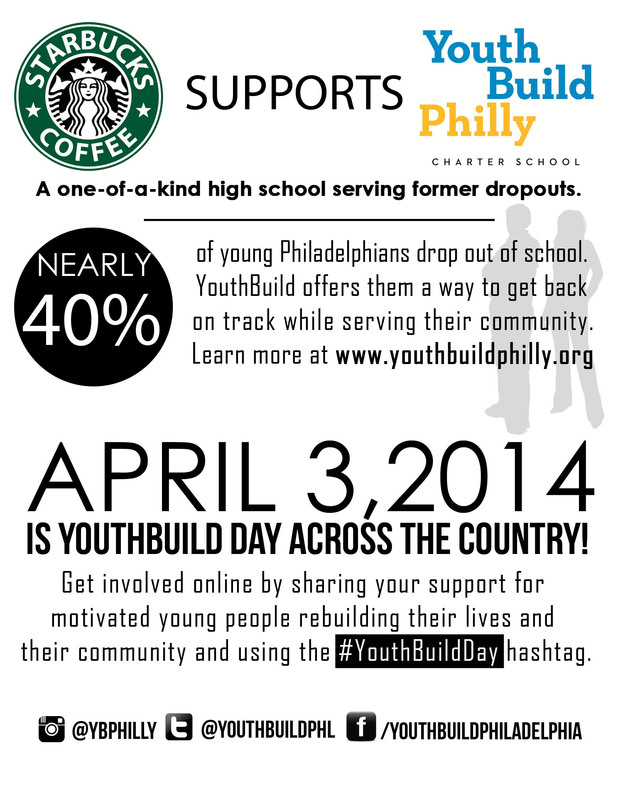 Over the past year, YouthBuild Philly and Starbucks have expanded on this partnership on the ground in Philadelphia, leading to new opportunities for students and Starbucks partners alike. Read on to learn more about this exciting and emerging partnership! Shortly after YouthBuild received the Leadership grant, Michael Scott, district manager, and Shannon Phillips, regional director, visited the school to meet with key staff and discuss ways that the two organizations could work together throughout the school year. Subsequent meetings with Starbucks Area 71 Community Liaison Caitlin Durkin allowed both organizations to explore opportunities for community service and leadership development together. Starbucks generously donated YouthBuild Philly a $100 gift card, in addition to providing coffee and snacks for Student Ambassador meetings and volunteer events. In December 2013, Caitlin attended a site visit at YouthBuild Philadelphia and had the opportunity to see our program in action and meet with a group of students to hear about the program from their perspective. Caitlin was so inspired by her visit that she encouraged Michael and Shannon to attend the next site visit which was scheduled in January. Brittany reps YouthBuild in her Starbucks barista cap. She reports that Starbucks is a supportive environment, just like YouthBuild. At this site visit, the Starbucks representatives were so moved by the personal stories of two of our students, Brittany and Carmen, who were doing extremely well in our program but both struggling with homelessness, that both of these students were offered job interviews at Starbucks. Brittany and Carmen were both subsequently hired at two different Starbucks locations in the Philadelphia area and both continue to be employed there. In fact, Brittany was recently offered a promotion to shift manager, a job that pays $13 an hour. Brittany and Carmen are extremely proud to be employees at Starbucks and wear their Starbucks hats and other logoed gear to school nearly every day. They report that the Starbucks work environment is very supportive and reminiscent of YouthBuild. Both students even have mentors! 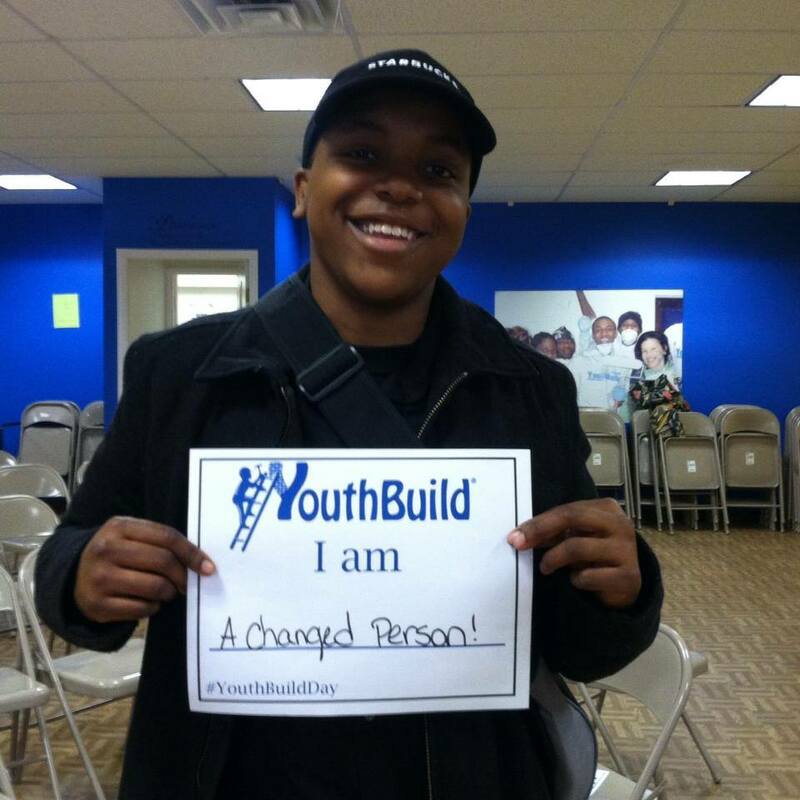 On April 3, the national network of YouthBuild programs celebrated the first ever YouthBuild Day, during which local programs organized events to raise public and political support for the YouthBuild youth development model. In Philadelphia, YouthBuild Day activities centered on a flyer and social media campaign to encourage former high school dropouts to apply to YouthBuild for the coming school year. Caitlin Durkin generously offered to coordinate Starbuck’s support for YouthBuild Philly’s campaign, and secured the participation of several stores in Center City Philadelphia. These stores displayed posters and flyers specifically created for YouthBuild Day, and provided YouthBuild Philly shirts to employees to wear during their shifts. Caitlin reported that many customers recognized the shirts and were pleased to learn that Starbucks had ties to YouthBuild Philly. 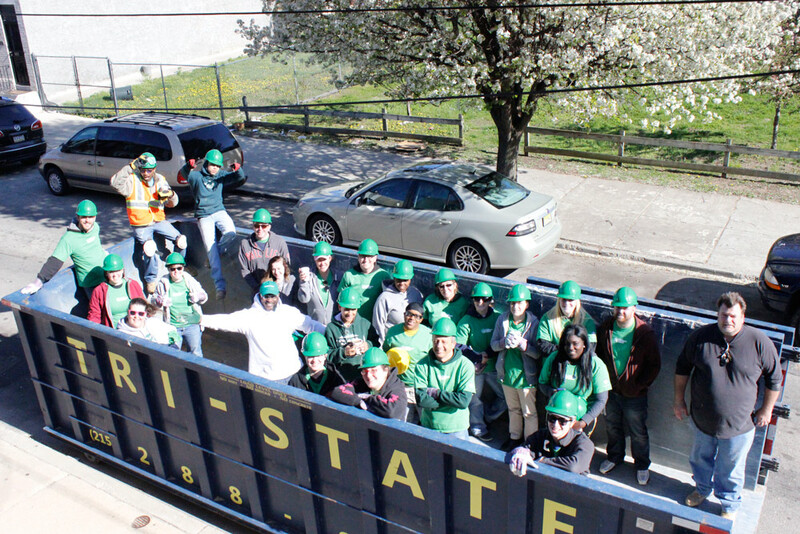 On April 12, one staff member and twelve students joined Starbucks employees and volunteers from the Urban Tree Connection for an Earth Day community clean-up in West Philadelphia. On April 24, Michael Scott coordinated a volunteer day for partners at a YouthBuild Philly construction worksite. Students are renovating this formerly dilapidated home in the Strawberry Mansion section of the city, and their recent demolition work left a great deal of debris in the back of the property. Starbucks partners volunteered alongside students (including Brittany, who represented both groups) to thoroughly and safely transfer this debris to a dumpster for removal.This part of the renovation process benefits greatly from added manpower, and would have taken at least twice as long without the extra hands and enthusiasm provided by Starbucks volunteers. YouthBuild students greatly enjoyed working alongside Starbucks employees (some even inquired about careers with Starbucks), and it was heartening to witness the care and passion that Starbucks partners had for giving back to their local community. Starbucks employees and YouthBuild students pose in the dumpster they’re about to fill with demolition debris. Looking ahead, we hope to continue partnering with Starbucks as a prospective employer and service partner, and to explore other ways that our organizations can work together to develop youth leaders and build a brighter future for the Philadelphia region.